What Size Images Should an Art Show Use on their Web Site. This is an ongoing issue where some art shows display artist jury images at a too large size on their web site to promote the show. I’m not saying that the shows shouldn’t use the images. In fact it’s in the agreement we sign when applying to the shows. But there needs to be some common sense in how large the images are displayed. My personal preference in web image size has always been 500 pixels long dimension. Resolution (72PPI vs. 300PPI) is irrelevant. I’ve used 500 pixel images on my web sites for years and it’s never hindered a sale. The ZAPP and JAS images enlarge to 700 pixels when you view them in your profile. But for art shows to use to promote their event, even 700 pixels is too large and not any more effective than 500 pixel images. Artists and shows need to be aware that recently a jeweler was caught using other jewelers jury images to apply to shows. There have been many cases of art shows exposing the artists to possible loss of copyright, design and loss of sales by posting the full size images to their web site, or even Flickr. 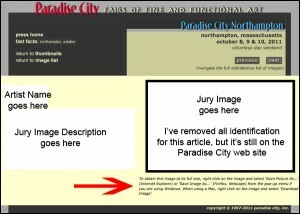 The worst I’ve seen is on the Paradise City web site where, in 2011, they posted the full size jury images with instructions under each image how to save the full size images back to your computer. On the Paradise City web site screen capture below, I removed all artist identification and I’m not going to post the link to any of the full size image pages either because that will contribute to the problem. It didn’t take me long to discover that Artfest Fort Myers has a Flickr page where they upload the images much too large. For the first few artists I checked, the images at full size were between 1500 and 1920 (full size ZAPP images) pixels long dimension, with instructions on how to download them. First of all, both ZAPP and JAS need to have something in the show’s contract specifying the maximum size the images can be displayed on the web. And they should provide that size to every show for that purpose. I think the solution is that there needs to be a penalty involved for shows that abuse it by posting larger size images, maybe something like $20 per image. It only has to happen once and word will get out. $20 per image for 200 artists is $4,000. That should make a show think twice before doing it again. Artists need to check the web sites of the shows they are accepted to, and not be afraid to call it to the show’s attention if they are putting the images in jeopardy.